Samsung is known around the world for its smartphones. But in its home market of South Korea, the huge company is a whole lot more than just a tech brand. Its businesses reach deep into many parts of people's lives, from the cradle to the grave. South Koreans can be born in a Samsung-owned medical center, grow up learning to read and write with the help of Samsung tablets and go on to attend the Samsung-affiliated Sungkyunkwan University. It doesn't end there. They may then live in a Samsung-built apartment complex, fitted out with the company's appliances and electronics. South Koreans can even end up at a Samsung funeral parlor when they die. Samsung is one of South Korea's chaebols -- large, family-controlled conglomerates that have dominated the country's economy for decades. However, the powerful corporations' close ties to the South Korean political elite are now facing unprecedented scrutiny. Samsung's de facto chief, Lee Jae-yong, was arrested Friday over allegations of bribery and other charges. Lee and Samsung deny the accusations, which have thrust the company into the heart of a massive political scandal that has rocked the South Korean establishment. 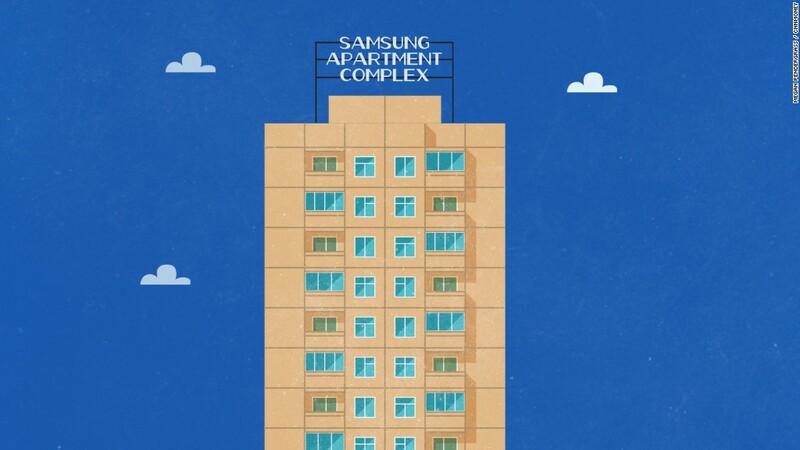 Samsung plays an outsize role in the country's economic life. Its various affiliated companies account for more than 20% of the entire market value of the Korean Stock Exchange -- most of that coming from the crown jewel, Samsung Electronics (SSNLF). The conglomerate's businesses are estimated to account for around 15% of South Korea's entire economy. Samsung's success at home and abroad -- it's the world's largest maker of smartphones -- has made it a key symbol of South Korea's economic transformation. The country went from one of the world's poorest countries after World War II to one of the richest in recent years. Steve Chung, a Korea expert at the Chinese University of Hong Kong, says many South Koreans still have a lot of respect for the economic model that "helped their nation build up throughout the last 40 years." But that's now being tested by the huge political corruption scandal that has engulfed Samsung and other chaebols. The far-reaching scandal has driven hundreds of thousands of South Korean protesters into the streets and prompted lawmakers to vote to impeach President Park Geun-hye. Other top South Korean companies are also under investigation. Samsung's links to the corruption investigation have done further damage to the company's image after the humiliating fiasco over its fire-prone Galaxy Note 7 smartphone last year.